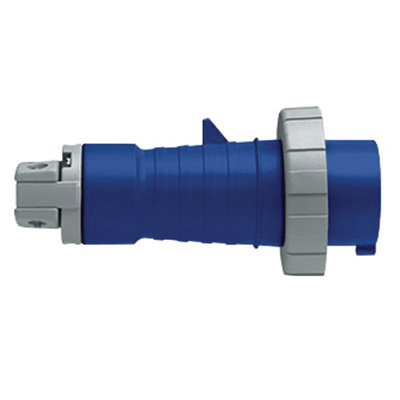 Leviton 2-Pole 3-Wire Water-tight IEC pin and sleeve plug in blue color, is current rated at 20-Amps and voltage rated at 250-Volts. It accepts cords of size 0.350 - 0.86-Inch. This industrial-grade plug features V-0 flame rated Valox 357 construction with corrosion-resistant brass contact. The contact/pin carriers of this plug have reinforced nylon construction for offering greater strength and temperature resistance. It has a dimension of 2.8-Inch Dia x 5.83-Inch. This plug has superior UV stability and withstands 2000-Volts dielectric strength. This plug has IP67-degree of protection to safeguard against ingress of solid objects and liquids. Plug is UL listed, CSA/CE certified and meets North American IEC 60309-1/60309-2 standards.